Eighty brand name and designer outlet stores are featured including: American Eagle, Banana Republic Factory Store, Brooks Brothers Factory Store, Calvin Klein, Coach Factory Store, Cole Hahn, Fossil, Gap Outlet, GUESS, Gymboree, H&M, IZOD, J.Crew, Michael Kors, Nike Factory Store, Nine West, Puma, Skechers, Tommy Hilfiger, Under Armour, White House Black Market and many other popular designer outlet brands. To celebrate the grand opening we are offering shoppers a Savings Pass, Facebook fan exclusive offers, events with Kris Allen and Vanessa Lachey, as well as events to get everyone in the holiday spirit. We have events going on all weekend including a tree lighting ceremony where we will have fake snow all weekend as well as a concert with American Idol's Kris Allen on Friday. 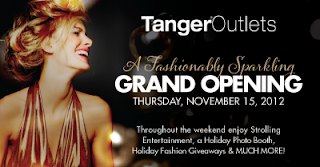 A Fashionably Sparkling GRAND OPENING! THURSDAY, NOVEMBER 15, 2012 Throughout the weekend enjoy Strolling Entertainment, a Holiday Photo Booth, Holiday Fashion Giveaways & MUCH MORE! Tanger is going to great heights for holiday lights at the unveiling of a 30ft tall Holiday Tree accompanied by music and lots of holiday cheer. Disclosure: In exchange for this post I may be offered a gift card.